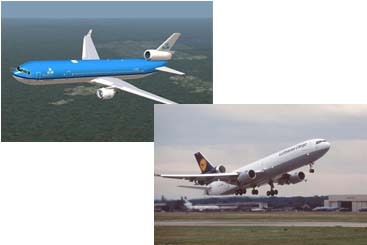 The Boeing MD-11 is considered a medium to long-range wide body airliner. It has 2 engines built on under wing pylons and a 3rd engine at the base of the vertical stabilizer. It is like the DC-10, but it comprises a stretched fuselage, greater wingspan with winglets. It has an all-digital glass cockpit which in turn decreases the crew to 2 from the 3 that is required on the DC-10. It was launched on December on 1986. The initial orders came Alitalia; British Caledonian; Dragonair; FedEx Express; Finnair; Korean Air; Scandinavian Airlines System; Swissair; Thai Airways International and Varig and 2 leasing companies Guinness Peat Aviation and Mitsui). The 1st MD-11 was delivered to Finnair on December 7 of 1990.